More than 400 victims of modern slavery have been given advice and support from Bristol-based charity Unseen’s helpline, thanks to the fund-raising exploits of national law firm Clarke Willmott’s base in the city. 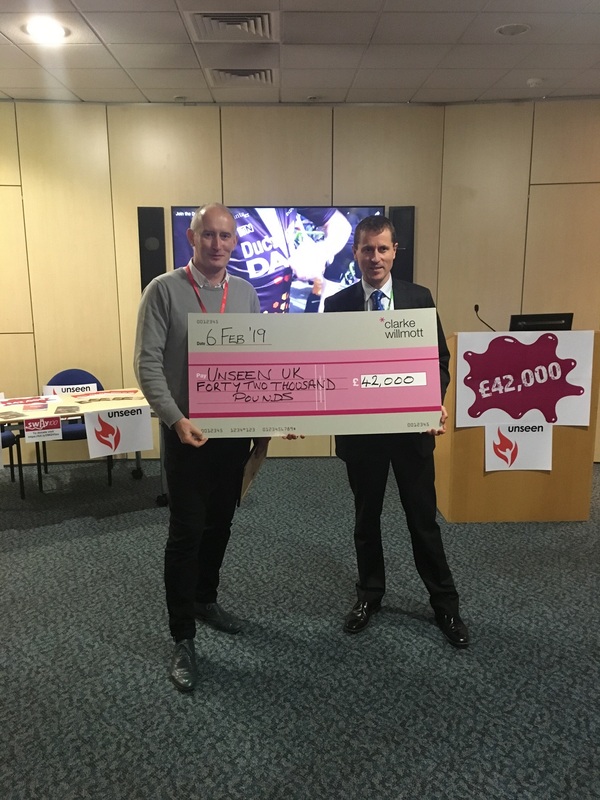 The office has donated £42,000 to the anti-slavery charity – the result of a continuous stream of fund-raising activities over the past two-and-a-half years, including fun runs, sponsored dress-down days and other events. Even before selecting Unseen as its chosen good cause Clarke Willmott was supporting the charity by providing spare office accommodation, meeting rooms and pro-bono legal support. Clarke Willmott Bristol staff also donated boxes containing clothing, coats, shoes, accessories, gifts, welcome packs for the safe houses, together with seasonal treats and gifts. At a special gathering to mark the conclusion of Clarke Willmott’s partnership with Unseen as its chosen charity, the firm’s CEO Stephen Rosser said: “We have been privileged to be able to help Unseen in its efforts trying to expose the truly awful scourge of modern slavery, which is sadly happening right here in the UK. “Not only does Unseen shine a light onto this terrible activity, it also provides invaluable support to victims, helping them to rebuild their lives following physical and mental abuse. Unseen CEO Andrew Wallis added: “Clarke Willmott has been with us from the beginning, generously giving us office space when we needed a home when we were just three people. Now there’s over 100 of us. Danh migrated from Vietnam to Europe along with his family. When he arrived he was targeted by traffickers who promised him a good job in the UK. However, he was instead forced to work in a cannabis factory and abused physically and mentally by his exploiters every day. He was not allowed to leave the factory and threats were made to his family to control him and prevent him from trying to escape. After receiving a severe beating, he was locked in a room. He searched for help online and found the Helplines number on a Vietnamese website. Within an hour Helpline staff had liaised with the police to have him removed and taken to a safehouse. Danh is now receiving the expert support that he needs to recover. He was able to see a GP within 24 hours of arriving at the safehouse and continues to receive treatment for his injuries. He is attending regular counselling sessions and is supported through one-to-one sessions with his dedicated support worker. He is learning English through Unseen’s in-house courses and uses the safehouse gym to improve his health. He loves cooking, and staff help him to source local culturally appropriate ingredients, which he uses to cook meals for the entire safehouse to enjoy. He also enjoys playing table tennis, chess and cycling around the local area. Staff are supporting Danh to receive legal support so he can eventually return home to be with his family after five years apart.